For more than 40 years, bone anchored hearing aids (BAHAs) have been a common treatment option for patients with conductive or mixed hearing loss, as well as single-sided deafness. If you work with bone conduction systems, you’re probably very familiar with the Baha® Connect and Ponto systems. The percutaneous BAHA technology was invented in the 1970s. Essentially, a titanium abutment is anchored into the bone and protrudes through the skin. An audio processor with a mechanical stimulator is attached to the abutment. 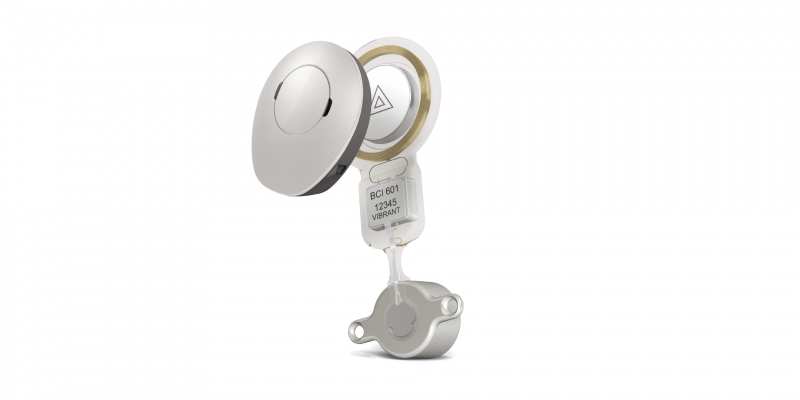 The two percutaneous bone conduction devices which are on the market today—Baha® Connect and Ponto—still use this very same technology. However, this percutaneous method often leads to complications including skin infections and osseointegration failure. Why are complications so common with percutaneous bone conduction devices? The abutment leaves an open wound which is prone to infections. The risk of infection is obvious, which is why permanent percutaneous systems are exceedingly rare in other fields of modern medicine. This protruding hardware and daily effort to prevent infection can be a significant burden on your patients’ everyday lives. The BONEBRIDGE is designed completely different. BONEBRIDGE is the first and only active bone conduction implant. BONEBRIDGE is a superior choice for ease-of-use in daily life. 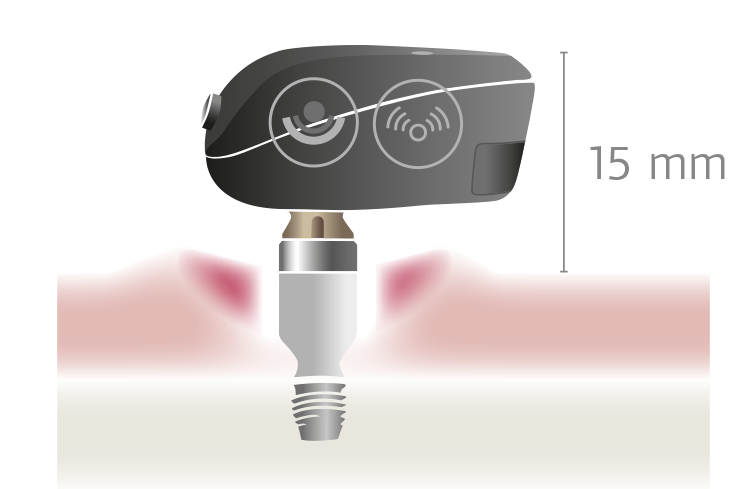 Your patients won’t need to spend any time or effort taking care of skin irritations caused by their hearing device. With BONEBRIDGE, they simply put on their SAMBA Audio Processor and can instantly enjoy their hearing without any pain or discomfort. 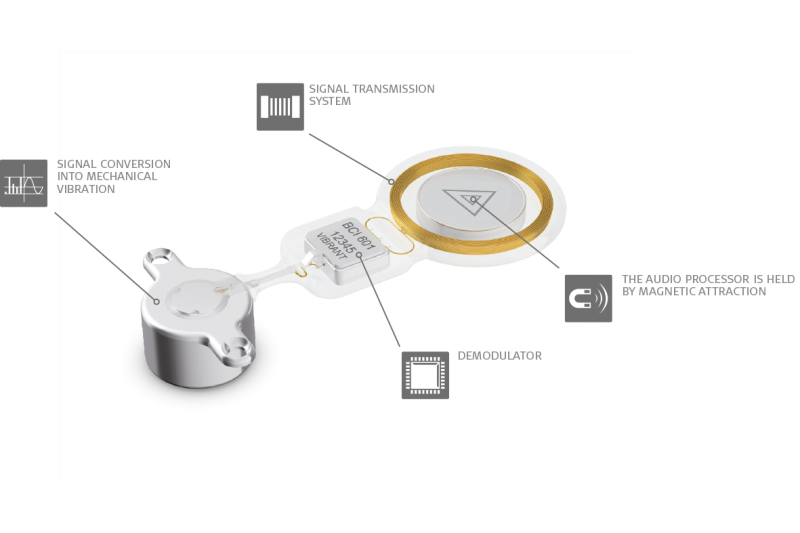 The SAMBA Audio Processor is held over the implant through light magnetic attraction. It offers the latest signal processing, directional microphone technology, and 5 programs so your patients can get the most out of any listening situation. “With SAMBA the hearing experience is better, clearer and feedback free.” – Margit M.
And because SAMBA is only for signal processing, it doesn’t contain a transducer. This design prevents feedback and makes SAMBA incredibly small & light, with the lowest profile available. Users can simply cover it with their hair and forget it’s even there. SAMBA has the lowest profile of any bone conduction system—delivering outstanding comfort and aesthetic appeal. Extensive literature has shown persistent complications of percutaneous BAHA devices. If you work with BAHAs, you’ve likely seen these complications firsthand. Recently, we analyzed a complete literature search of published studies and compared the safety outcomes of percutaneous bone conduction systems and BONEBRIDGE. The outcomes are startling: Up to 7x more complications occur with the Baha® Connect and up to 6x more with the Ponto System than with BONEBRIDGE. For a complete overview and comprehensive analysis of this complication rate data, you can download the full white paper here. With complications, your patients will need clinical care more often—and may even need revision surgery. These complications can mean more time and effort for you as a clinician and less satisfaction for your patients. What makes BONEBRIDGE so reliable? It’s simple: Healthy skin is essential for long-term patient satisfaction and overall positive outcomes. As the only active bone conduction implant, BONEBRIDGE enables healthy skin—making BONEBRIDGE the reliable choice for your patients. For you and your clinic this means that you can reduce follow-up appointments and the risk of complications. This can save time & resources and ensure better patient satisfaction. With all this in mind—if you had to choose a bone conduction implant system for yourself—which one would you choose? Have a question about BONEBRIDGE for your patients? Leave a comment below or send our experts a message with our simple contact form. Want to learn more? Read the full Safety Outcomes white paper here. Badran, K., Arya, A.,K., Bunestone, D., & Mackinnon, N. (2009). Long-term complications of bone-anchored hearing aids: a 14-year experience. The Journal of Laryngology & Otology. 123: 170–176. Schmerber, S., Deguine, O., Marx, M., Van de Heyning, P., Sterkers, O., Mosnier, I., Garin, P., Godey, B., Vincent, C., Venail, F., Mondain, M., Deveze, A., Lavielle, J.P., & Karkas, A. (2017). Safety and effectiveness of the Bonebridge transcutaneous active direct-drive bone-conduction hearing implant at 1-year device use. Eur Arch Otorhinolaryngol.274(4):1835–1851. Abdulrahman, H. (2007). BAHA: Bone Anchored Hearing Aid. Int J Health Sci (Qassim). 1(2): 265–276.